Sure, there’s no place like home—but what if you can’t really pinpoint where home is? 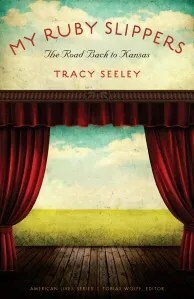 By the time she was nine, Tracy Seeley had lived in seven towns and thirteen different houses. Her father’s dreams of movie stardom, stoked by a series of affairs, kept the family on edge, and on the move, until he up and left. Thirty years later, settled in what seems like a charmed life in San Francisco, a diagnosis of cancer and the betrayal of a lover shake Seeley to her roots—roots she is suddenly determined to search out. My Ruby Slippers tells the story of that search, the tale of a woman with an impassioned if vague sense of mission: to find the meaning of home. AMAZING MEMOIR TO GIVE AWAY.